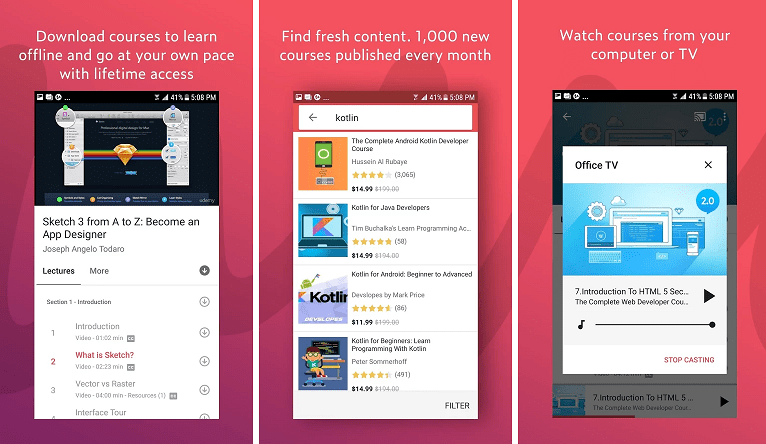 LEARNING APPLICATIONS are available in abundance on the internet, and on the Play Store. For you to not get lost amongst the thousands of options to choose from, we enlist the best picks for you. Life is about learning every day and mastering your craft. In the survival of the fittest, you need to be well knowledgeable and pre-equipped with your weapons of knowledge to excel wherever you go. Learning has no age limit and knowledge has no boundaries. 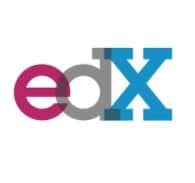 These applications will help you master skills from various domains spanning across general education, IT and computer sciences, hobbies, science and tech knowledge, how-to, and DIY. 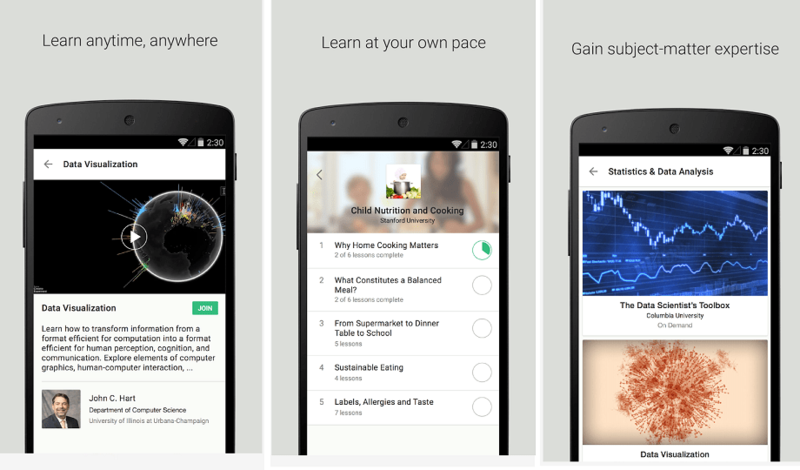 Check out these learning applications well suited for everyone. 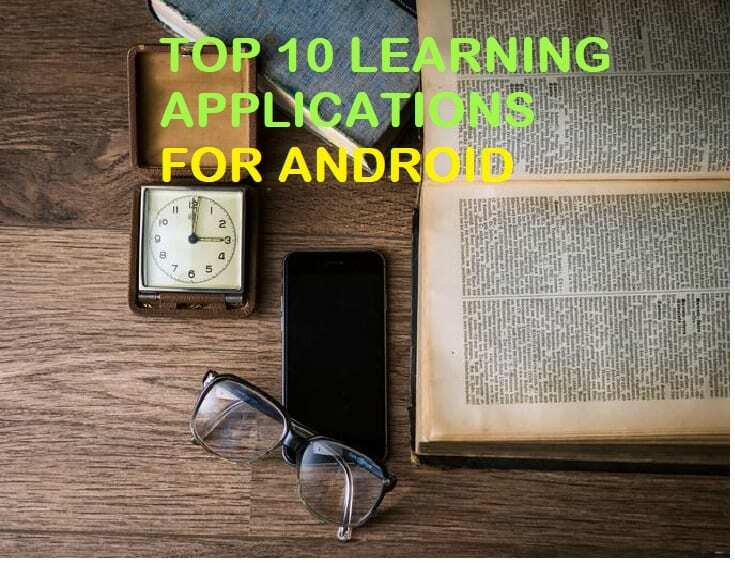 Continue reading to find out more about these android applications that make learning a piece of cake for you. We have included both paid and free applications for you to download from the Google Play Store through direct links, to serve you better. 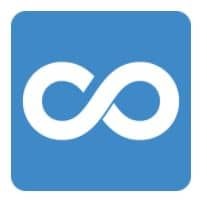 Trusted and downloaded by 500000 people across the globe across their Android devices, this application has a lot to offer. It has almost 60000 courses to choose from, each taught by industry experts. Every course is carefully curated and handcrafted on the basis of the level of difficulty. On completion of the course, a certificate can be downloaded by the user. It has a huge support community which will be helpful for minds that question almost everything. This education application ensures that you do absorb some new set of skills with your course of selection. You can choose to watch lectures anytime, from anywhere as per your convenience so you don't have to disturb your current schedules. Just when you thought that LinkedIn is only useful for finding potential employers and hiring employees, this company does ensure that you possess the right skill set to grab opportunities. With this application, you get access and insights to the top skills in demand and learn them from the comforts of your home. One can save courses to rewatch. More than 40,000 options are on the list for learning across business domains, soft-skills, tech know-how. What's more is that you can add the certificate of completion- directly to your LinkedIn profile. You can choose from game development, website development, Python and many more to name a few courses popular on this application. 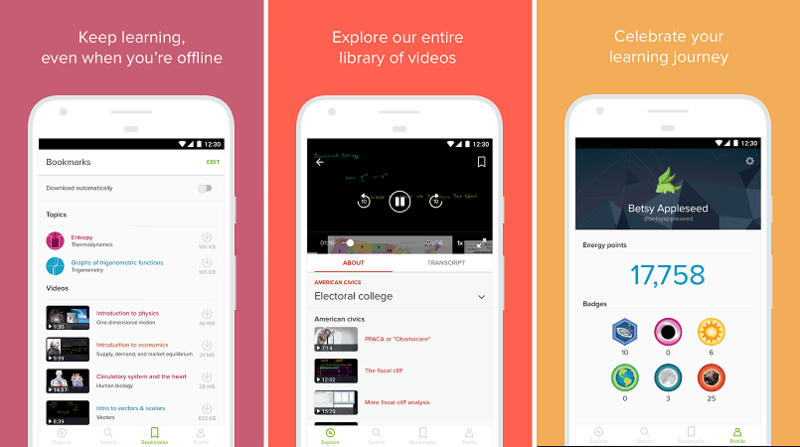 Another popular Education learning application that made it to editor's choice on the Google Play Store is Coursera. Widely known amongst college and university students, fulfils the purpose to this demographic and beyond. From data science, HTML, photography and music, this application got you covered. Download this application for seamless learning back from the application to the website. For a certification, however, you need to pay some nominal charges. You can choose to learn in languages that are understood by you easily- be it Mandarin or English. This application is another best downloaded by industry's best individuals. You can choose to auto-play from your course to the next best-suited tutorial. This application helps you get razor-sharp knowledge, again, taught by industry's best, the experts. What is different about this application is that you get customized recommendations. 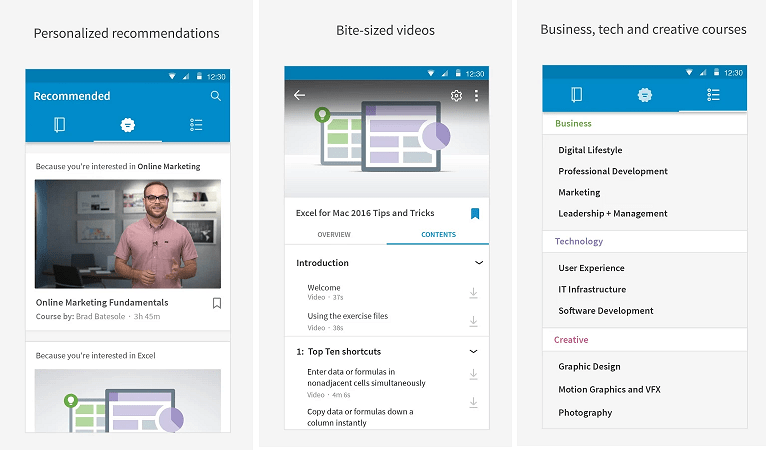 You can shoot these tutorials with your Chromecast, or simply download on your device for the best experience and hands-on assessment. We highly recommend this application for high school students as it got every foundation course covered for excellence in term examinations. 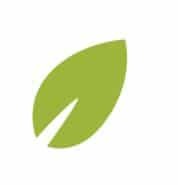 Widely acknowledged and praised for it, the tutorials offered on this learning application are simple to understand and come with easy to grab pointers. It comes with interactive exercises and prompt feedbacks so you can assess your areas of improvement. 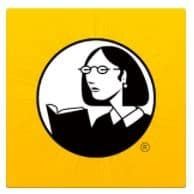 You can also use this application to prepare for important examinations such as SAT, MAT, GMAT etc. The resources available on this application are absolutely free of cost and will always be. The TED community and learning provide byte-sized learning, short and impactful for understanding even for a layman. Browse through hundreds of animated, voiced, and self-development videos delivered by experts and experienced minds alike, who have made ground-breaking movements to help the humankind. You can also choose to listen to podcasts delivered by remarkable and distinguished people. Save or bookmark them according to your need. Seamlessly stream amongst your devices. There is definitely something for every mood of your learning every day. Participate in quizzes or take tests anytime to gain a command of your knowledge and be more confident about it. The quizzes are brilliantly curated moving from foundation to expert testing. The quizzes are threaded by the best universities in this world- Harvard, Princeton to name a few. You can check your library of the courses selected by you on a neat canvas view, well suited for hassle-free navigation. This application gives you life-long learning. This gives you and millions of other users on this earth a customized learning experience. The courses developed here are from industry giant's experts from Facebook, Github to name a few. It's an innovative concept, that promises today's learning to shape your future. You get access to rich quality material, and a convenience to connect with your mentors to gain insight into your learning progress. This application is best suited for those who want to learn a new language and conquer the world. 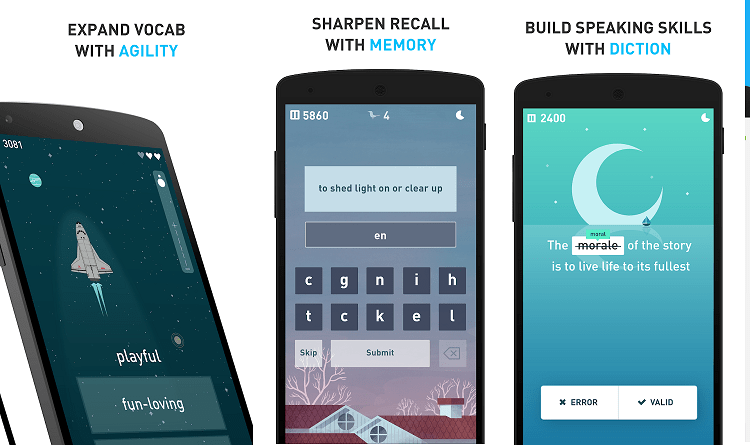 Choose amongst Fench, Spanish and 20+ languages to suit you the best. Learning a new language not only breaks barriers of communication but also helps you get a better understanding of new communities. be it for academic purposes, or for a vacation, this application will help you learn and start from the basics, so you can not get lost between the new syllables and tenses of a foreign language. The best feature of this application is that you can practice learning in a form of playing games. Having a sharper brain is easier now by training it. Sharpen your analytical thinking, logical ability, reasoning and improve your attention span. 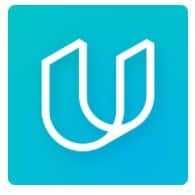 With the use of this application, you will see improved mathematical skills too, and overall development on a whole new level. Take a look at the detailed performance tracker, progress reports, and then chose from hundreds of games to boost these excellence indicators. You can also plan a calendar for your brain workout. 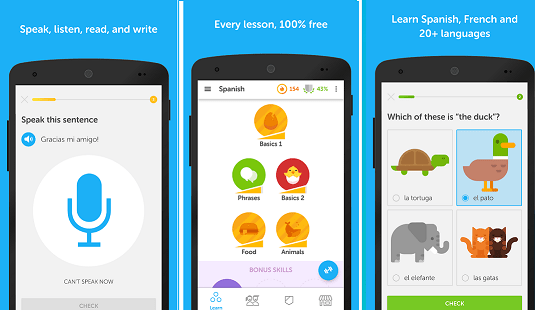 We hope these learning applications are handy and you are able to make the most of them. Photo Editors based on Artificial Intelligence - Do Robots know the best filters? Copyright © 2017 DroidTechKnow - All Rights Reserved.